Elmer will help you study for your amateur radio exams. Elmer is available for Macintosh and Windows systems. Elmer covers all elements, and prepares actual sample exams, which you take on your Macintosh or Windows computer. 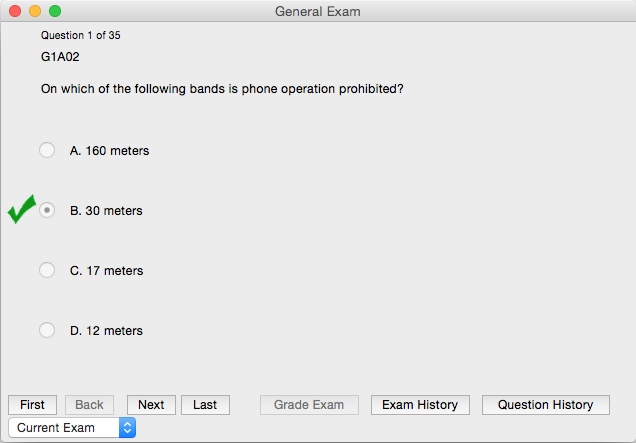 Each exam is graded, and you get to see which questions you missed, and the correct answer. After you've practiced using Elmer, you'll be all set to take your written exam! Also available for the iPhone / iPod Touch - Click Here! Buy your copy online, and get your registration code in minutes! I originally wrote Elmer to help study myself for the amateur radio written exams, and it has been used by thousands of others. Download a copy of Elmer today, and see for yourself! Elmer creates sample tests for you to take. 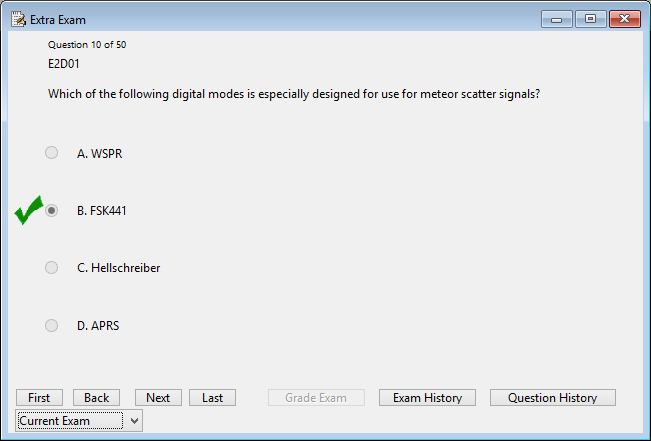 Each test is prepared from the exact same question pool as is used to generate the real ham exam you'll end up taking. Each section of the prepared exam includes exactly the same number of questions as does a real amateur exam. The new RF Exposure questions are also included, along with the relevant diagrams. So once you master the sample exams prepared by Elmer, you'll be assured of passing your written exam! Elmer keeps track of the results of each practice test you take, so you can monitor your progress. Elmer also keeps track of each question you correctly and incorrectly answer, and focuses on those questions you've missed when preparing new practice exams. This let's you concentrate on the questions you need additional practice with, allowing you to master the questions more quickly! Elmer 9.4.0 is now available, and includes the new Extra question pool, effective July 1, 2016. It also includes several user interface enhancements and bug fixes. You may also wish to take a look at Morse Mania - a morse code tutor for the Mac. We're so sure that you've find Elmer useful that we're offering you a risk-free deal. You can go ahead and download a copy of Elmer for absolutely free. Give it a try, and see how easy it is to use. Once you've decided that you find it useful, go ahead and register your copy. If for some reason you decide Elmer isn't for you, just throw away your copy. That's it! Just wanted to thank you for a great product! I passed my General class test this morning with flying colors! Your program was exactly what I needed. I had spent a lot of time studying the material but really needed to take the practice tests, over and over. Your program, Elmer, was *exactly* what I needed and it worked so well I'm considering studying and using Elmer to go for my Extra in a few months. I just thought I should let you know... I took my exams yesterday... and passed... Technician, General... and Extra! Thanks for writing Elmer; it really helped a lot! Passed Extra first try! Thanks again!